San Leandro Plumbing Contractor | Service You Can Trust! 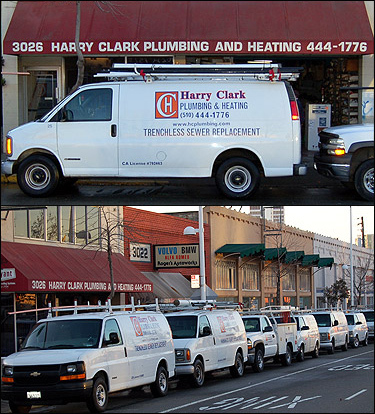 Harry Clark has been a San Leandro Plumbing Contractor for over 60 years. San Leandro weather is nice but when the fog or wind rolls in, it is cold. Whether you need service or repair of your old heating system or need replacement with new, Harry Clark is your San Leandro Heating Contractor. We are highly rated by the Berkeley Parents Network, BBB, and Consumer Checkbook. We Feature Energy Star Furnaces and thermostats, and out technicians are properly trained. Call for service you can trust. We service and know the neighborhoods of San Leandro. We have serviced all of San Leandro Neighborhoods including: North Area, Estudillo Estates, Bay-O-Vista, Downtown, Eastshore, Mulford Gardens, Marina Faire, Bonair, Washington Manor, Floresta Gardens, and Halcyon-Foothills. If you have any questions, please do not hesitate to call us at . If you would like to schedule service online, just visit our service request form. Thank you for your interest in Harry Clark of San Leandro, CA!